Today up for grabs we're got three prizes for you...this means there will be THREE WINNERS! Please use the form to enter the giveaway and don't forget to let me know which prize you prefer! Congratulations on having 50 followers! I've loved your blog for a while so it's really cool to see it getting so popular! :) My favourite polish has to be glitter gal holo red. I've only worn it once and I had to take it off 'cos I did nothing but stare at my nails! Thank you! Ohh Glitter Gal...they make such crazy holos! This remins me, I need to get some. Congrats! My favorite polish is BarryM - Raspberry. I love its deep colour! My favorite polish would be Gimme A Grape Big Kiss from Color Club's Wicked Sweet collection because it actually smells like Pixy Stix! :D Mmmm. My favorite polish is Orly Liquid Vinyl because I can layer anything over it. Ooh I share your sentiment! My fave is WnW Black creme since...it's the perfect black for me. so useful! Congrats on 50! :) My favorite polish...of the moment...is Essie Pop Art Pink. The perfect squishy light pink that is wonderful on its own or as a part of jelly sandwiches, glitter gradients, etc. Wonderful! How nice of you to do this giveaway! I'm definitely gonna submit an entry. Congrats on reaching so many followers btw! Also, Orly It's Not Me, It's You is so pretty! I know what it's like to have old favorites...You remember them forever! Thank you! Ozotics are suuuper nice ♥ It's a dream of mine to own some one day! MY favourite nailpolish is Watermelon by Essie! It's a darker hot pink which can sometimes look a little red, but it's totally cute! Congrats! :3 I love the Nicki minis. My favorite nail polish is Glitter Gal Lizard Belly. I love how is looks in different lights and the formula on it is amazing. My favorite polish..that's tough. out of what I have, I'd probably choose Essie - Smooth Sailing. I haven't actually used it yet though, so maybe I'm not allowed to call it my favorite! I recently picked up SS as well! It's such a unique polish in terms of finish and color, good choice. My favorite nail polish is Black by Kleancolor... I know it is such a simple color but is a color I use over and over again, I used it for stamping too. Thankee! I also agree with you on a simple black being the top color...it's just so versatile and useful! <3 black polish a lot. Whoa that's a lot of favourites! (my list is quote long too...yikes.) So you're a ChG lover, eh? I am definitely hunting for White Cap and Snow Globe...ChG has such amazing colour choices! Congratulations on 50+ followers! My favourite polish at the moment - because trust me it changes CONSTANTLY! - would have to be China Glaze Dorothy Who? At the moment, my fave nail polish is Essie Bobbing for Baubles. It's a great color on its own and even better as a base for layering! Thank you so much for the giveaway! My favourite color is gold OPI :) I love to shine! i love glitter nail polishes! congrats on the followers, and thankyouuu soo much for this awesome giveaway ! hhmmm, my favourite is probably opi - opening night gold ! I love Smokey Blue, from Mavala. Love the colour and how fast it dries. My favoriter polish always changes, but at the moment I am in love with OPI Merry Midnight! I don't have favourite polish because i love all nail polish!!! My favorite polish is Nicole by OPI's Listen to Momager! I saw Kris Jenner wearing it on KKTNY & immediately coveted it so when I saw it in the store I had to grab it and I LOVE it! Thanks for the chance to enter and become a follower! If you have the time, please take a look at my blog & drop a little advice or comment? Thanks, again! My favorite is China Glaze Ruby Slippers because it's classy(red) and fun(sparkles)at the same time. My fave polish is Zoya Faye, so pink & gold & sparkly, what more could a girl want!! I am seriously lusting for the holos. They are so pretty. I did a mini-holo on my toes and fell in love. my favourite nail-polish is the red one by catrice. My favorite nail is OPI - lincoln park after dark. Beautiful color and perfect for the fall/winter. omg i can't get this OPI, i would love to win it!!! I'm still trying to find my favorite, it's a tough job, but I'm working through it. :) Right now it's anything blue with some sparkle. Favorite Polish for now is China Glace - He's Ging In Circles (need a new one soon). Thank you for the Giveaway! My favorite polish is LA Rock Star - Groupie. I recently discovered it...it's everything I love about my former favorite (OPI Ink.) but ten times as bright and vibrant! I don't just have a single favorite polish, it'd be impossible to pick just one! My favorite shade is definitely sapphire blue though, and Maybelline's Denim Dash is a great shade. i like the red nails; il s my favorite color. OPI Sweetheart, such a natural and beautiful color! oh my bad, just read the question: my favorite polish is my OPI Lincoln Park after Dark. my sister has a nail polish i love too (which i need to borrow!) it's China Glaze's Ruby Pumps. SO IN LOVE with that color! i'm a sucker for glitter though lol. Congrats on the followers... my favorite polish is Nicole by OPI Khloe Had a Little Lam-Lam. I love glitter gal - fuchsia because it's a lovely color and the quality is awesome! I love OPI polishes cos' their colors are really beautiful,and they look good on my fingers. Hello and Congrats on the growing number of followers! I like Art de Lautrec nail polishes! I love the bright colors from their collections! I love all the minis of Nicki Minaj! But the green more. i love Nicki Minaj set! hi!i love the first because i love the colour matte! That's an awesome giveaway by the way, congrats!! My favourite polish... has to be Pillow Talk by Leighton Denny :) Gorgeous dark pinky red. Advanced congrats to the 50th! :) I am joining! :) Enter me. Thankyou for this giveaway opportunity and congratulations on the milestone! My favourite polish at the moment is Gem by Nubar because it's a cute fall colour, prefect for now. My favorite polish is OPI's I'm Not Really a Waitress. Caprice LE Rock Barock polish #1 Pearls & Chains, as it's very feminine and subtle. Cute nails on the minis pix. congratulations!!! i really love the green in the opi set!!! My favorite polish right now is Zoya Kristen! It's so pretty and perfect for winter. To be honest my favorite Nail Polish at the momment is the L.A. Colors line. They are inexpensive and come in soooo many nice colors! My favourite polish is Face of Australia's Molten Metallics in Verdigris (it's an amazingly unique shade of green) shame it's limited edition though! 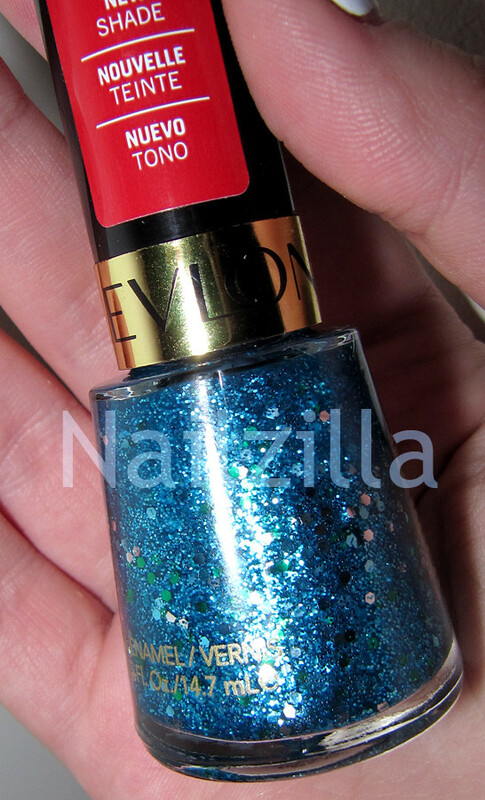 I like the Revlon Blue Mosaic because make me think to summer! my fav nail polish is the essie sugar daddy coz its very perfect for my nails! My favourite nail polish is China Glaze For Audrey! my fav. 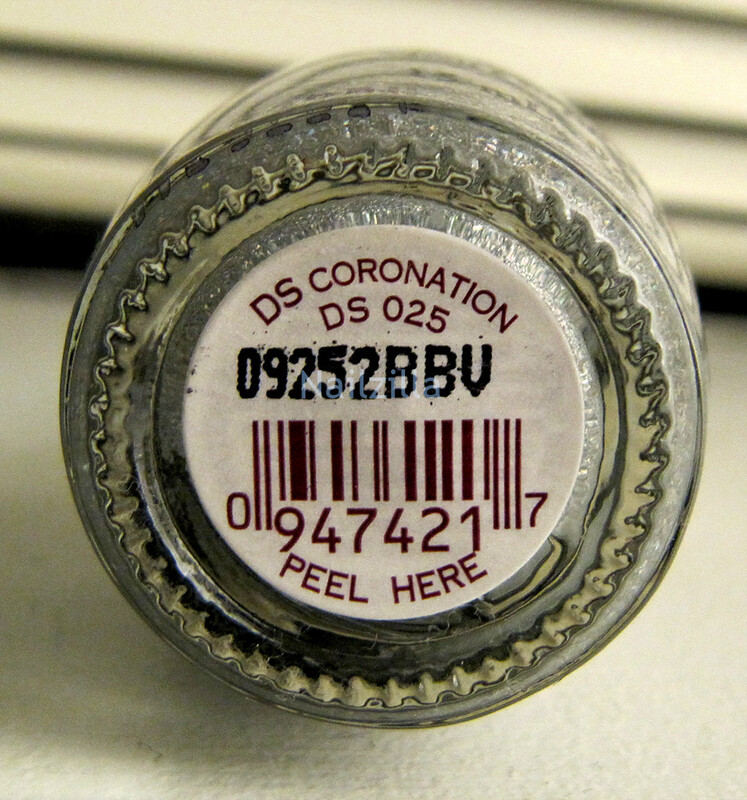 polish is kiko 241! amazing colors :X thx for this giveaway. I love O.P.I. because of the quality and good result! HI! Forgot to put my favorite polish in my previous comment so I deleted it. I love them all, but right now I'm loving my Zoya's the colors are awesome and it's excellent quality. Thanks for a chance!!! Congratulations on having 50 followers! YAY for 50 followers and many more to come!!!! I'm not sure if I'm doing this right, but if I win I'd love the DS Coronation. Either way, great job and great blog! My favorite polish (right now at least) is OPI's Houston We Have a Purple - it's so cute on my nails! P.S. Your header/mascot is freaking cute, fyi. I did it wrong! In fact my favorite nail polish I've ever used has got to be OPI Russian Navy. I'm a sucker for dark blues and that one has many facets, in my opinion. 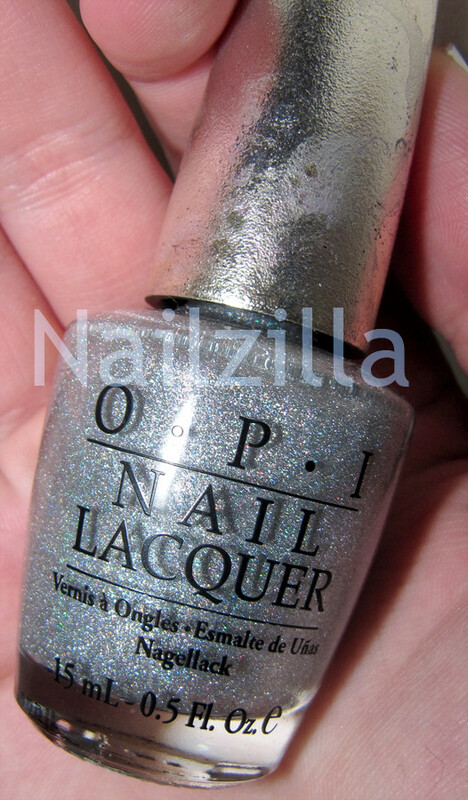 my favorite polish is opi stranger tides because is a relaxing color and really beautiful grayish green!! OPI'S bubble bath has to be my favorite nail polish ever! My favorite nail polish is Faye by Zoya because it's the most beautiful duochrome I've ever used! Gosh, this is always such a hard question for me, but right now I'd have to say Zoya's Roxy is my all-time favorite. Thanks for the awesome giveaway and congrats on all of your followers! May you have many, many more! That's a tough question, but I would have to say that my favorite nail polish is OPI's Pamplona Purple, it's exactly my favorite color, but the Nicki Minaj Fly is climbing up that list! fave polish AT THE MOMENT is ozotic pro 528 ...even though i dont have a bottle (YET!) It's so pretty! I love Opi I'm not really a waitress because it is a classic color! My fav polish at the moment is Sally Hansen Manicure Boca Mocha! Its such a great caramel latte brown! Definitely a great & unexpected transition colour into sprint. I don't know why my comment did not go through :o. My favorite polish is actually my first Zoya Polish ever--Edyta! It's a darker shade (my comfort zone) but the microshimmers really do bring the colour to life! awesome giveaway! the opi mini set is really cute.